31 Marlborough is located on the north side of Marlborough, between Arlington and Berkeley, with 29 Marlborough to the east and 33 Marlborough to the west. 31 Marlborough was built ca. 1870, one of three contiguous houses built in the same style (29-31-33 Marlborough). The similarity in style of these houses has been largely obliterated by the lowering of the front entrance of 33 Marlborough in 1916 and the significant remodeling of 31 Marlborough in 1937. The land on which 31 Marlborough was built was part of a larger tract of land originally purchased from the Commonwealth of Massachusetts on November 6, 1858, by George Goss. He and his partner, Norman Carmine Munson, were the contractors responsible for filling the Commonwealth’s Back Bay lands. The original tract had a frontage of 421 feet and ran from where 9 Marlborough would be built west to Berkeley Street. On the same day he purchased the land, George Goss subdivided it into smaller parcels and sold them to several different buyers who then resold the land to others. Click here for an index to the deeds for 31 Marlborough. On December 18, 1869, the land for 31 Marlborough was purchased from Charles Freeland by his brother and business partner, James Horatio Freeland. He had his wife, Julia (Woodruff) Freeland, built their home there. They had married in February of 1868 and previously had lived at 25 Chester Square. On February 21, 1871, James Freeland transferred 31 Marlborough to his wife during her lifetime, with ownership to revert to him and his heirs after her decease. On December 11, 1877, he transferred his residual interest in the property to her. Julia Freeland died in April of 1888. 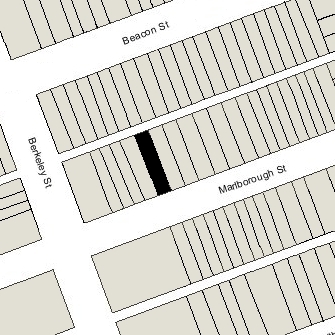 James Freeland continued to live at 31 Marlborough in 1890, but had moved to the Hotel Brunswick (southeast corner of Clarendon and Boylston) by 1892. 31 Marlborough was not listed in the 1891 Blue Book. On October 1, 1891, 31 Marlborough was purchased from Julia Freeland’s estate by Frances Elizabeth (Hilger) Wildes, the wife of dry goods merchant Frank Waldo Wildes. They previously had lived in Newton Centre. Frances Wildes died in August of 1916. Frank Wildes continued to live at 31 Marlborough in 1921, but had moved to Charlestown by 1922. 31 Marlborough was not listed in the 1922 and 1923 Blue Books. On March 15, 1923, 31 Marlborough was purchased from Frank Wildes and his son, Theodore Bradstreet Wildes, by attorney William Read Buckminster. He and his wife, Mary Alice Edwards (Miller) Buckminster, made it their home. They previously had lived at the Hotel Victoria at 273 Dartmouth and in Malden. They also maintained a home in Chocorua, New Hampshire. Mary Buckminster’s mother, Mary Alice (Edwards) Miller, the widow of Walter Herbert Miller, lived with them. She died in December of 1924. During the 1930-1931 winter season, they were joined by their son-in-law, Pelayo Garcia de Olay. He had married in April of 1922 to the Buckminsters’ daughter, Joan; she died in March of 1928 in Cairo, Egypt. He appears to be the man later closely identified with the Fascist movement in Spain. On December 26, 1934, William Buckminster transferred 31 Marlborough into his wife’s name. The Buckminsters continued to live at 31 Marlborough until about 1937. In April of 1937, Mary Alice Buckminster filed for (and subsequently received) permission to remodel the house into six apartments, one on each floor, including lowering the front entrance to street level, “modernizing” the front façade with a stucco surface, and adding a rear ell. The remodeling was designed by architect Roy Thomas Pryor. Plans for the remodeling — including elevations, floor plans, and foundation plans for the rear ell — are including in the City of Boston Blueprints Collection in the Boston Public Library’s Arts Department (reference BIN P-146). On February 9, 1938, 31 Marlborough was acquired from Mary A. E. Buckminster by her daughter, Constance Bradley (Buckminster) Marcy, the former wife of William Lake Marcy, Jr. She lived in Darien, Connecticut. She remarried in December of 1940 to Heinrich (Heinrick) F. Hauser, an author, and on February 25, 1942, she sold the property to 31 Marlborough Street, Inc.
31 Marlborough subsequently changed hands, remaining a six unit apartment house. On June 30, 1952, 31 Marlborough was acquired by Charles Sidney White and his wife, Elvira Rose (Binda) White, who lived in one of the apartments. They previously had lived in Newton. Elvira White died in December of 1958 and Charles White moved soon thereafter. On June 29, 1959, 31 Marlborough was acquired from Charles S. White by Harold Hurst, S. Joseph Nemetz, Leon N. Shapiro, and Golda M. Edinburg. On May 1, 1961, it was acquired from them by real estate dealer Hugh R. Farrington, trustee of the 31 Marlboro Street Trust. On August 1, 1962, 31 Marlborough was acquired from Hugh Farrington by Gerald C. McCarthy. On January 2, 1968, he transferred the property to himself as trustee of the Gerrard Realty Trust. On October 1, 1986, 31 Marlborough was acquired from the Gerrard Property Trust by John A. Forger and Nicholas L. Vinios, trustees of the 31 Marlboro Street Realty Trust. 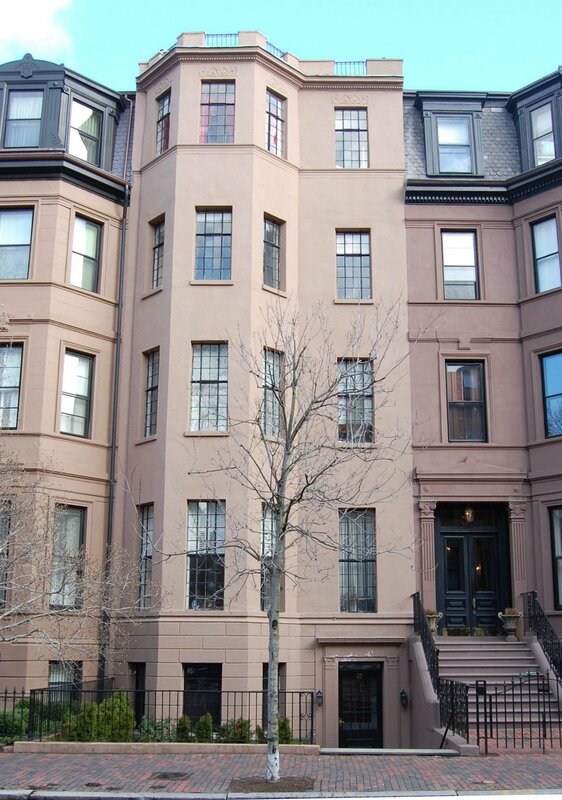 On March 31, 1987, they converted the building into six condominium units, the 31 Marlborough Street Condominium. They retained ownership of all six units and continued to rent them as apartments. On August 13, 1992, the Gilpa Corporation purchased all six units. As of 2015, they continued to own all of the units and rent them as apartments.